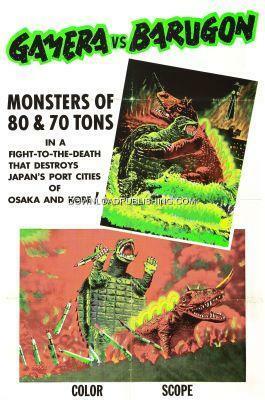 The Second Gamera movie, the first one in color! An expedition is sent to retrive a giant Opal worth $4 million, that was hidden inside a Cave deep in the jungle during the war. They find the Opal but they soon find out that the Opal is really an egg. Barugon, a giant reptilian monster, is hatched from the egg and wrecks havoc on Japan with its rainbow energy ray that emits from its back and its ice cold breath. Gamera, a giant flying turtle, shows up to save the day.